Little bumps on the skin are very common. They can occur due to many reasons; such as infections, skin disorders, allergic reactions, congenital lesions, and skin cancers. Most of these are harmless and may not need treatment. However, skin cancers need early analyze and treatment. Little bumps on the skin may vary in number and appearance according to the cause behind it. They can be skin colored or another color can feel soft, firm or hard, with varying sizes. Some can cause itching and irritability. You can leave them alone if the little bumps on the skin do not cause any discomfort. However, if they increase in size, become painful or appearance of the lesions change rapidly it is better to seek treatment from a doctor. 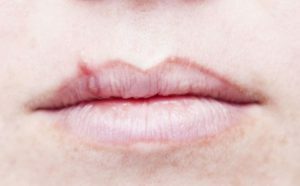 Cold sores (fever blisters) are tiny fluid-filled blisters occurring around your lips. They are caused by Herpes simplex Virus Type 1. It is contagious and spreads by close contact and kissing. There can be itching and burning sensation. If the blisters burst, oozing and crusting occur. There is no cure but they spontaneously disappear in 2-3 weeks. Applying ice or cold water over the lesions will help ease the symptoms. Using an antiviral ointment like Docosanol (Abreva), Denavir or Penciclovir over the sores will help control pain and promote healing. If lesions are severe the doctor will prescribe an oral antiviral like Acyclovir. Viral warts are small, fleshy, rough skin growths which occur in fingers, hands, and soles of your feet. They are caused by the Human papillomavirus, which is contagious. They will clear with time even without treatment. Applying salicylic acid over the wart several times as a home remedy can help removal of wart layer by layer. 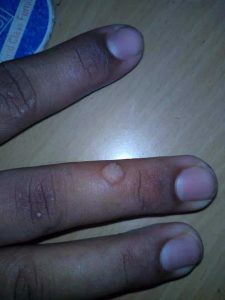 The doctor will do cryotherapy using liquid nitrogen to freeze the wart and subsequently, it will fall off. This is a viral infection commonly seen in children. It can spread from person to person by contact. They are small, round, painless, firm bumps which are flesh colored. The doctor will apply strong acids like TCA to the lesions which induce peeling off of the bump. Cryotherapy can be tried too. Boils are painful and they usually arise as small red bumps which are formed under your skin. They later fill with pus, due to infection and inflammation of the hair follicles caused by bacteria. Never break boils as damage to the skin can worsen the infection. If the boil is small an antibiotic cream like Neosporin or Polysporin can be applied. For larger and multiple boils your doctor will prescribe an oral antibiotic. Scabies is caused by a mite who burrows into the skin. The reaction from the skin towards the mite causes a red, papular (like bumps) rash which is intensely itchy. It is a common skin condition which is highly infectious. It is spread in overcrowded places like extended care facilities, homeless shelters, and nursing homes through bedding and furniture. Scabies can be treated easily by prescription of a scabicide (Medicine that kills the scabies mite). Medication should be applied all over the body except face (neck down up to toes). Treatment should be done not only for the patient but his or her close contacts as well, as it is highly contagious. Acne is the common skin disorder causing little bumps. It is a skin condition which usually affects the face but also neck, chest, and back. Most people with acne are aged between 12- 25 years. Severity can range from mild to severe. It is caused by overactivity of sebaceous glands in the skin. The sebum (natural oil) which is produced comes out through tiny pores. When these pores get blocked by thickening of the skin and dead cells the sebum collects under these blocked pores. A bacterium called Propionibacterium acne multiplies in trapped serum. Sometimes inflammation occurs making the surrounding skin red. Acne can be associated with open comedones (blackheads) or closed comedones (whiteheads), pustules and scarring. There are various topical medications used to treat acne, such as retinoids, benzoyl peroxide, topical antibiotic gels etc. When severe oral antibiotics like doxycycline and anti-hormonal treatment is used by the dermatologists. These are harmless skin disorder causing little bumps that occur on upper arms, buttocks, and thighs. There is no pain or itching. These bumps are dry and rough. They are felt like sandpaper resembling goose flesh. Keratosis pilaris can occur at any age but common in children. A good emollient can be used but usually, there is no cure and it cannot be prevented. They are brown, tan bumps which are waxy and scaly. They are harmless and noncancerous lesions commonly seen in older adults. There is no pain or itching and can be left alone. However, if cosmetically concerned electrocauterization or surgery can be done to remove. Skin tags are also common skin disorder causing little bumps. They are small skin colored growths commonly seen around neck, underarms, and groin. There is a fleshy stalk called peduncle attached to this little tumor making it look like a hanging grain of rice. They can get irritated by jewelry, clothes or by shaving. Moles are small, brown spots which are a common type of growth on the skin. They are formed of melanocytes (pigmented cells). They usually appear in children and young adults and may continue to adulthood. Moles can be caused by excessive sun exposure or due to genetic predisposition. They can run in families. They are round or oval in shape and less than 6 mm in diameter. Most moles have hair growing from within. Moles can occur anywhere on your body. Many people have up to 40 moles. They can grow bigger and darker due to hormonal changes as in puberty and pregnancy. Moles can be left alone or surgically removed. Rarely moles can change appearance and become atypical moles which can be precancerous lesions. They are common lesions which can occur anywhere in the body. They usually appear after 30 years of age and increase in number with age. It is reddish in color as it is formed by a collection of small blood vessels. They are harmless and can be left alone. If cosmetically concerned, they can be removed by electrocauterization, cryosurgery or LASER. If there is frequent bleeding and rapid changes in appearance seek help from a doctor. 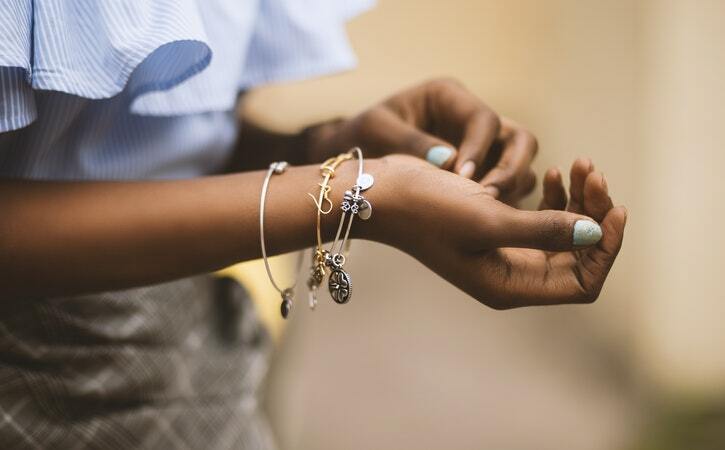 Urticaria can occur anywhere in the body, commonly face arms, legs, and back. 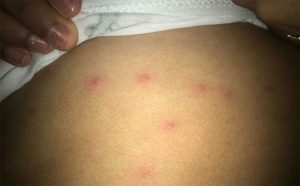 They are itchy, red or skin-colored bumps with a surrounding red halo. Although hives are a quite common hypersensitivity to the allergens occur in certain individuals only. You can apply calamine lotion to soothe the area and take an OTC antihistamine to reduce itching. Some individuals develop an allergic reaction to insect bites. These little bumps are red, itchy and sometimes painful. They are common in legs and feet. Sometimes the bite site can get infected and look like small pus-filled blisters. Common insects causing an allergic reaction are fleas, mosquitos, ticks, ants and bugs. As home remedies, use over the counter antihistamine for itching and acetaminophen if painful. Hydrocortisone cream can be applied over the bumps for relief. These are the commonest form of skin cancer. They look like pink growths, shiny bumps, red patches or sores. Basal cell carcinoma arises from basal cells. Squamous cell carcinoma is a form of skin cancer resulting in prolonged exposure to UV radiation. If left untreated they can become aggressive and metastasize (spread) to other parts of the body. This is the most serious type of skin cancer developing from melanocytes (melanin-producing cells). Prolonged exposure to UV radiation may be a risk factor. If a skin lesion is growing rapidly, has an irregular border, has various colors, bleeds easily or rapidly changes in appearance that can be a suspicious lesion which points toward skin cancer. Always seek help early as early analyze and treatment save lives.